Westmoreland Cleanways and Recycling DOES NOT clean up trash that was dumped with the knowledge and consent of the property owner. We assist with the cleanup of trash on public rights-of-way and on private property where the property owner clearly did not know about the dumping or was not in a position to stop it. Westmoreland Cleanways and Recycling DOES NOT initiate cleanups without a local contact or partner. Westmoreland Cleanways and Recycling encourages and assists committed stakeholders to clean up illegally dumped trash in their own neighborhoods and communities. We’ve found that only when people have a personal stake in cleaning up an area and in keeping it clean will our efforts have a lasting effect. Without local involvement, sites often become trashed within weeks of a cleanup, wasting everyone’s hard-earned resources. Anyone, from anywhere in Westmoreland County, can request assistance from Westmoreland Cleanways and Recycling. Our staff will meet with you to assess the site to be cleaned and to develop a plan of attack. If a site can be handled by volunteers, WC will provide cleanup supplies such as trash bags, gloves, and safety vests. Disposal for tires and trash is arranged as necessary, using local resources or a hauler. Most municipal officials are supportive of cleanup efforts in their community and will do what they can to assist the effort. Cleanup organizers should have their own volunteers lined up for the majority of the labor. Funding required for illegal dump cleanups varies depending on the volume and type of trash to be disposed, and accessibility and terrain at the site. Cleanup organizers can often get local businesses to donate refreshments, water, and other supplies. The use of heavy equipment such as cranes, front-loaders and dump trucks can often (but not always) be arranged at no cost. 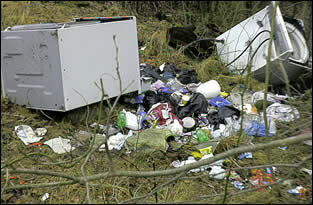 Private property owners may be asked to cover some costs if they fall outside the scope of a “typical” cleanup. Westmoreland Cleanways and Recycling stands ready to assist any resident, community group, or municipality to organize a litter cleanup or the cleanup of an illegal dumpsite. Forewarned is forearmed. Be prepared and know what to expect. By doing so, the cleanup will be more successful. A cleanup takes time, energy, community resources, and money. The following guides will help ensure those efforts are not wasted and will increase the chances of the area remaining clean once the cleanup is over. Road adopters perform a valuable service for their neighbors and for the environment by removing thousands of pounds of trash from our roadsides each year. Individuals, families, businesses, and social clubs throughout the county can adopt a section of county or local road, a greenway, or even a community. (State roads are adopted through, PennDot’s Adopt-A-Highway Program). Adopters agree to clean up the area a couple times a year and to report your efforts. In turn, the adopter’s name is placed on a sign at each end of the adoption announcing to the public that the road is under the watchful eye of concerned residents. Municipal officials are often involved in local adoptions, assisting adopters with trash disposal, placement of signs, and special support that may be necessary. Westmoreland Cleanways provides supplies: trash bags, gloves, and safety vests, safety signs and flags for use on particularly busy roads and can assist with technical support. Keep Pennsylvania Beautiful, Westmoreland Cleanways’ affiliate partner, oversees and administers the road adoption program across Pennsylvania. Adoption applications, cleanup reports, permission forms, and other correspondence are filed with Keep Pennsylvania Beautiful. Every Sp ring, March 1st – May 31st Pennsylvanians across the state and Americans across the Country participate in the Great America Cleanup. 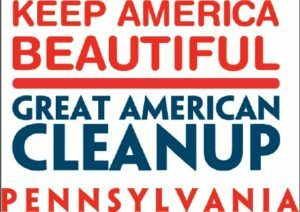 Registration for the Great American Cleanup of PA, sponsored by Keep Pennsylvania Beautiful, begins mid- January. Visit the Great America Cleanup of PA website to find out more information or to register your cleanup event or another project such as tree plantings, educational program, or other beautification project. When it’s time for your cleanup, pick up your cleanup supplies (gloves, trash bags, safety signs) from Westmoreland Cleanways and Recycling. Westmoreland Cleanways and Recycling provides financial assistance to Westmoreland County Municipalities for the proper disposal of illegally dumped tires collected by their road crews. The TRAP program is a great recourse as road crews have the ability to pick up tires on a regular basis; before mosquitoes can lay their eggs in them, and before one or two tires in an area grow into a known dumpsite. Municipalities can call the office for details and to request a TRAP coupon. Although TRAP is geared towards municipalities, occasionally this program can be used to fund a community group’s tire cleanup. The availability of using TRAP funds by a community group is determined by Westmoreland Cleanways and Recycling on a case by case basis and available funding. In an ideal world, everyone would have a litter bag in their car and take their trash home. Until then, carry a plastic bag with you while you walk, get your neighbors involved in a cleanup, or adopt your road or neighborhood. It requires little effort but makes an enormous difference in community pride and environmental health.